Currently undergoing expansion to accommodate larger vessels to improve port operations. Exact docking locations may vary. The port is close to town. 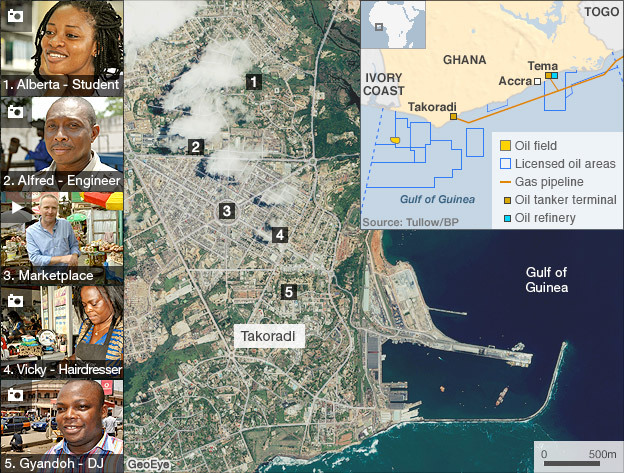 The twin city of Sekondi-Takoradi was Ghana's first deepwater seaport and has prospered greatly. Still, the ambiance is rather laid-back, especially in the inviting beach areas. Monkey Hill, a tropical reserve for primates, lies in heart of city. Nearby Fort Orange was built by the Dutch in the 17th century and now serves as a lighthouse. Visitors can observe a window into the natural world of Ghana at the Monkey Hill nature preserve located in the heart of the city. Further afield join us as we look back at the tragic history of the Atlantic slave trade at Elmina Castle, the earliest known European structure in the tropics; built in 1482 by the Portuguese. Wander the ramparts of Cape Coast Castle and view villagers mending fishing nets and setting out to sea in painted fishing canoes. Explore one of the Ghana’s last remaining tropical forests at Kakum National Park and walk through the verdant canopy. Check out the ‘Artisan center' this is where you'll find a selection of Ghanaian souvenirs. ‘Takoraki Market' is another popular place to shop – be sure to haggle though to get the best price possible. You'll find anything from cuisine, electronics to local fashion here.